Frequent cruise departures – choose the one that is right for you! A San Francisco Bay Cruise is the perfect introduction to San Francisco and a ‘must do’ when you visit the city. With over 100 years experience, our local partners are the original providers of this essential S.F cruise and a fantastic experience is guaranteed for all! Board a comfortable boat for the delightful narrated cruise and lean over the rail to admire San Francisco’s renowned skyline. Pass under the magnificent Golden Gate Bridge and marvel at its colossal span. Return past notorious Alcatraz Island, site of the former federal prison that once housed Al Capone. The cruise starts from Pier 43½, Fisherman's Wharf, San Francisco. As boarding happens on a first-come, first-served basis we suggest you arrive 25-30 minutes before your chosen departure. The boat cruise ends at Pier 43½, Fisherman's Wharf, San Francisco. Your exciting trip will be enhanced by an excellent audio commentary, available in no less than 12 languages (English, French, German, Spanish, Portuguese, Korean, Japanese, Mandarin, Italian, Thai, Russian and Hindi). Headphones are provided. 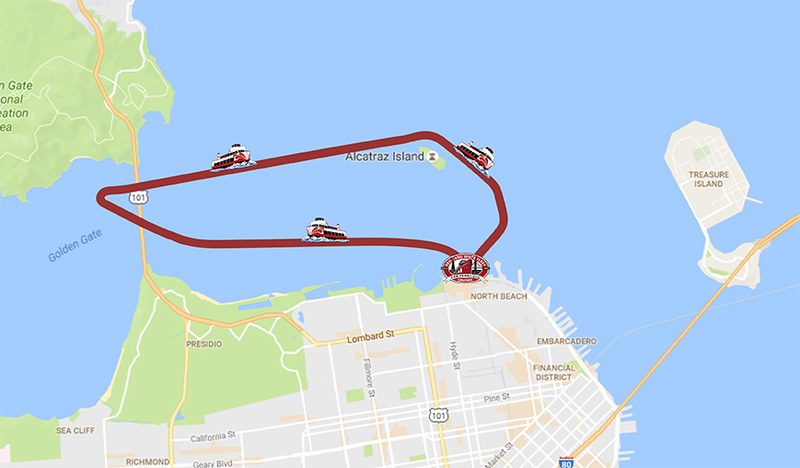 Sail past the San Francisco skyline and view the lively neighborhood of North Beach, the famous swimming clubs of Aquatic Park, the historic vessels at Hyde Street Pier, the San Francisco Maritime National Park, and numerous other exciting sights. As you head west towards the Golden Gate Bridge, cruise along Fort Mason and the Marina District which was devastated in the 1989 earthquake. Next, enjoy views of Crissy Field and the lush hillsides of the Presidio—both former army installations—that are now part of the Golden Gate National Recreation Area. Don’t miss incredible photo opportunities when sailing directly under the massive 4,200-foot span of the 746-foot tall Golden Gate Bridge. As you sail under the beautiful Golden Gate Bridge you will have the opportunity for fantastic photographs of this magnificent engineering feat. Looping back into the Bay you will pass the important wildlife sites of the Marin Headlands, part of the Golden Gate Biosphere Reserve. Sail past the town of Sausalito and see its 400 houseboats in all shapes and sizes. Sausalito was notorious as a center for bootlegging during the Prohibition era. You will slowly cruise around the infamous island of Alcatraz, a federal penitentiary for 29 years. Notorious inmates included Al Capone and Robert Franklin Stroud, the ‘Birdman of Alcatraz’. Sailing back towards Fisherman’s Wharf look out for the splendid art deco Coit Tower. As you near the Wharf, you may hear the barking sea lions at Pier 39. After your enjoyable 1-hour cruise, you will be dropped back at the start point. Boarding is offered on a first-come, first-served basis. The tickets are open dated, and can be used for up to one year from the date specified at the time of booking.